I was born in Luxembourg (Europe), almost exactly 36 years ago. To be honest, I was not one of the children or teenagers who knew what they wanted to become when they grow up. And to stay honest, I still don’t know exactly to this day. After school I got advised to start working for the government; jobs are well paid and stressless. But considering my tasks, I did not have the feeling that there was any particular skill or performance needed to get them done, nor was there any desirable achievement in the years to come. In the following 12 years, I switched administrations and ministries, trying to find more fulfillment and happiness in what I was doing during the day. But sooner or later the daily routine made me feel very miserable and frustrated. I started to realize that though I still did not know what I wanted to become, I knew exactly what I did not want to do anymore: sitting in an office from nine to five, doing the same administrative work, day after day, without any motivation, without any personal goal. There must be more in life for me!? My husband, Alain Schlesser, at that point also a government agent, was fed up as well and decided to quit his job and start freelancing as a web developer focussing on WordPress – so at least one of us had a specific goal. In summer of 2014 I opted for a four year sabbatical, we sold everything we owned in Luxembourg and moved to the German “Eifel” quite into the middle of nowhere together with our three french bulldogs Jasper, Duke, and Indra. I did not have the slightest idea of where my personal journey would lead me in the end, but I had the feeling that it was time to take better care of myself. First, I started studies as a dog health & behavior trainer, which I completed successfully. After the studies, I got sick and depressed. I gained more and more weight, was constantly dealing with all sorts of aches and had severe doubts about what the future might bring to me. And the more I doubted, the less productive I got. In summer of 2015 I got the diagnosis that I was suffering from lipedema – a chronically progressive disease which is basically a very painful fat disorder, that almost exclusively affects women. I decided to completely change my life and focus on my mental and physical health. Meanwhile, my husband was working hard to achieve his personal goals. At that point I did not have a very clear idea of what he was actually doing during the day, nor was I interested in any details. I had nothing to do with the web or computers in general, except for Google, Facebook and writing emails. Coding, programming, developing, those were foreign words to me. 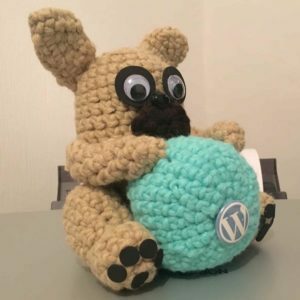 A few years back, I had started two blogs on wordpress.com where I shared my dogs’ stories and my experiences during my studies – that was the only knowledge I had about Alain’s new world – and about WordPress. Today I agree that these were hard times for us: we spent 24 hours together in the same house but we did not have much to share anymore: I had locked myself out of the life my husband was leading during the day due to a lack of interest and knowledge on one side, and fears on the other. I entered the world of WordPress because Alain invited me to join him in a trip to WordCamp Europe 2016 in Vienna. Despite looking forward to exploring a new city and do some shopping, I had no expectations of what I was going to experience in Vienna. To be honest, I was scared of meeting the “nerdy” part of my husband’s life and of not being able to get involved in it – again. However, what happened in Vienna was totally unexpected and overwhelming for me: I met hundreds of open-minded, interesting, welcoming, friendly and helpful people who were interested in what I had to share with them, although I was not involved at all in WordPress or the community so far. I probably had the most inspiring discussions I’ve ever had in my life and one of the funniest and joyful weeks too. There were more than two thousand people, and nobody (!) made me feel uncomfortable, ignorant or out of place. I have never experienced such an unconditionally welcoming atmosphere before – and I noticed that I truly wanted to be a part of that amazing community in the future. To be honest, I actually had withdrawal symptoms once we were back home. I got very active in following up and my Twitter account, which I had registered years ago without ever having tweeted before, suddenly got filled up with WordPress people. 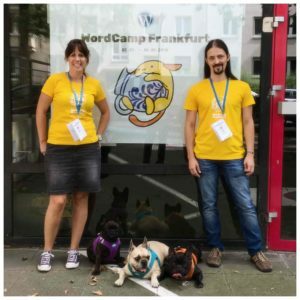 Only a few days after being back in Germany I started to organize trips to other WordCamps, and in September of 2016 Alain and I traveled together with our three dogs to WordCamp Frankfurt (Germany) – both of us as volunteers, and Alain as a speaker too. Volunteering felt excellent and right, and we got in touch with the German WordPress Community for the first time. Alain’s talk was a success, and the German community adopted our entire family immediately; we loved seeing our dogs getting spoiled with hugs and treats. In October of 2016 we joined WordCamp Netherlands in Utrecht where we once again met interesting and friendly people. Another premiere for me: “How WordPress Saved My Life” by Sally Mayor was the first talk I ever chose to see at a WordCamp. As you can imagine by reading the title, this was totally inspiring to me. Just as with the previous WordCamps, Alain and I hardly spent any time on our own: hospitable organizers, volunteers, speakers, and attendees surrounded us and insisted on showing us the best spots and restaurants in town. Two weeks later, we visited WordCamp Cologne (Germany) where we looked forward to seeing some of the lovely people we met two months before at WordCamp Frankfurt. I helped out at the registration desk, as I did in Frankfurt – definitely one of the best opportunities to get in touch with the community. At that point, I also took part in my first “Contributor Day”. I participated in the Polyglots team as well as in the Community team, as these don’t require technical knowledge. At the end of the day, I had localized one free theme into German (which was committed the same day) and joined the discussions for organizing a new type of WordCamp. As I was more interested in contributing to the community part, I joined Slack and was again diligent in following up. I wanted to become an active part of this community and help create and maintain the welcoming atmosphere I have experienced myself. It worked out very well: I am now a member of the organizing team for a very special German WordCamp with a unique and new concept, to happen in 2018. 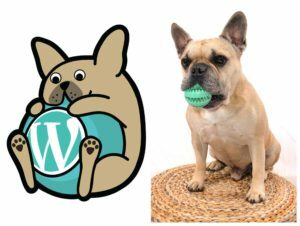 Another idea was born at WordCamp Cologne: designing a Wapuu with the characteristics of a french bulldog. Meanwhile, our dogs had become an integral part of the German community, who considers our frenchies as the unofficial mascots. Said and done – by channeling designer skills that I did not even know about, I created the “Wabully”. Jasper, our nine-year-old male frenchie was the template. Besides all the positive and inspiring input for my brain, I took good care of my physical health too. I continued losing weight due to healthy and fresh nutrition, and my fitness level increased because I was doing sports again. My lipedema therapy – including two surgeries – was very successful and so my physical and mental health got better and better. In 18 months I managed to lose almost seventy pounds. I was actively taking control of my life again. In November of 2016 Alain and I joined our first WordPress Meetup in Cologne. Dominik Schilling was sharing his experience during his WordPress 4.6 release lead. 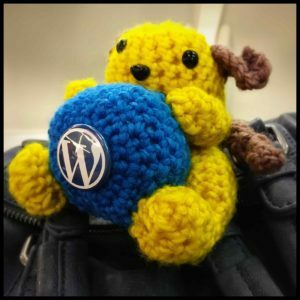 I noticed that all this “WordPress-stuff” was not so strange to me anymore; I managed to follow most of Dominik’s testimonies – and it was interesting to me through the entire talk. I realized that WordPress was not a mystery to me anymore and that discussions at home must have changed a lot in the past months. Now I knew the people Alain was talking about, I understood most of the projects and concepts he was referring to, and I was not bored anymore when he was talking about his current development issues. I encouraged Alain to book a trip to Philadelphia in December of 2016 to attend WordCamp US – an amazing, precious and fruitful experience for him. Unfortunately, I could not join him because of surgery. I admit that I was a bit jealous at that point, but I (rightfully) had a hunch that this trip could be important for my husband and his professional future. Earlier that year in spring, I had created a Facebook group for lipedema affected women in Luxembourg together with a friend. Lipedema is largely unknown in Luxembourg and often misdiagnosed as simple obesity. There is almost no help for affected women in my country of birth. I was indeed very lucky having moved to Germany, where the specialists in lipedema diagnosis and treatment are located; otherwise, I would probably not have been diagnosed and treated correctly up until now. 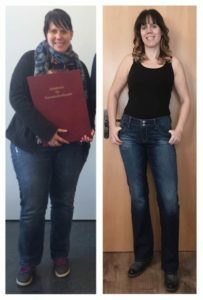 Inspired by my personal success and the growth of our Facebook group I decided, in January of 2017, to fight for a change in Luxembourg together with other lipedema patients. We have been very active in educational work and we built a significant presence in Luxembourgish media in the past few weeks. The feedback was enormous and we founded a nonprofit association. I knew it would be very useful to create a website to reach more affected women, doctors, and other interested people. I accepted the challenge and decided to set up a WordPress site. Alain built a theme according to my ideas and I successfully completed my very first plugin installations – most importantly for me a page builder called Beaver Builder. I had never imagined how easy, fun and fulfilling building of a website could be! With almost no skills and within a period of seven days only I managed to create lots of valuable content with a nice structure. I admit that living under the same roof with a devoted and passionate developer made some things easier for me. But besides that, I began to understand what makes WordPress so special: everybody who has something to share is given the possibility to do so by WordPress. If I managed to do that, why wouldn’t you? There are plenty of possibilities to help you build your website, blog or business – use them! And many fantastic WordPress people offer their support, contribute every single day to improve the software and to make it accessible for everybody out there. And some specialists offer great courses for absolute beginners like I am, to help them improving their skills. We have reached many lipedema patients through my website “Lipödem Lëtzebuerg”, who thank us every day for our commitment as so-called lipedema fighters. I am so happy that lipedema is now a topic of discussion in Luxembourg, which is not only a consequence of our devotion but also due to WordPress allowing me to build a website in a very short amount of time, and with almost no skills. Meanwhile, in collaboration with the National Patients Representation, we have formulated concrete demands concerning diagnosis and therapy to the Luxembourgish Government. I am overwhelmed and happy to see how much attention and gratefulness my work and website have earned. It fulfills me in a way that I had not experienced in the past 12 years during my well-paid job. It turned out that my enthusiasm and content writing skills were noticed by the CEO of a startup in Luxembourg. I got a remote job offer for writing and managing content on their WordPress website and for being a part of the social media team. We are currently testing a possible cooperation, and I have already been writing some of the content for their website. Furthermore I got contacted to work on the elaboration and social media spreading processes of an important lipedema study in Germany as well. I was not even actively searching for a job and the offers come rolling in nevertheless – what an amazing new experience! As member of an organizing team, I was in charge of finding the perfect location for a WordCamp in 2018. Together with some of my colleagues I have visited some excellent sites in Germany, and I am leading the negotiations. In February of 2017 Alain and I have been asked by Birgit Olzem to be part of the organizing team of the WordPress Meetup Eifel, which we both were delighted to accept. The first Meetup organized by the new team of three will happen at the end of April. In March of 2017 we flew to WordCamp London. We were both volunteering and I feel honored that I was part of an outstanding team which made every possible effort to organize a welcoming and amazing event for every single attendee. In terms of inclusivity and accessibility, WordCamp London set high standards: there has been a lactation room, a crèche, a multi-faith room, a quiet room, live transcription of the talks, life essential boxes in women’s and men’s restrooms. Almost every area was accessible to wheelchairs – with volunteers designated to help in the few spots that weren’t. We had a lovely and inspiring time there and I have yet to follow up with everyone. It makes me feel like my family grows with every WordCamp. Last but not least I want to share that I submitted a lightning talk proposal to WordCamp Europe 2017 in Paris. It took all of my courage, but I was feeling so honored and inspired by Topher’s request to write an essay for HeroPress that I realized there might be a story which deserves to be told. I was so proud to have applied as a speaker that it wouldn’t even matter in the end whether my talk is accepted or not. Alain has applied as speaker as well, and we will both help as volunteers again. I can’t wait to be part of this big event. I look forward to seeing friends and meeting new people. It will be my one-year anniversary of being part of the WordPress community – a year with lots of positive changes and inspiration. In the end, my talk proposal for WordCamp Europe has not been selected. Of course, I felt a bit sad about this. Even if I was aware that there had been over 300 applications for more or less 40 spots, I had some kind of feeling of having “failed” on my first try… But after having slept on it, I soon got over my deception and I was pleased for Alain for having reached a milestone: his talk proposal got accepted. And most importantly, I decided not to let this discourage me from applying as a speaker again. There are other WordCamps and all things happen for a good reason: I was pondering for weeks if I should attend WordCamp Berlin or not. I love the community, I love the city but Alain already had other plans. Said and done – I booked a hotel, bought my ticket, applied as a volunteer and submitted my talk proposal, slightly modified and in German. This time my lightning talk got accepted and I will be a speaker for the very first time at WordCamp Berlin on the 13th of May – I am more than excited about it. Alain’s plans were changing so that he’s now able to join me with our dogs on my trip to Berlin. I hope that I can give something back to the WordPress community with what I’m doing. I am a true WordPress community lover by now. I would like to encourage the people out there to use WordPress – especially when they think they don’t have enough skills to build a website. There is no such a thing as “I can’t do this.” – Yes, you can! As long as you have something to share with the world, or a business idea or any other motivation that drives you – just spread it. WordPress gives you the opportunity to be whoever you want to be and to give yourself a voice. 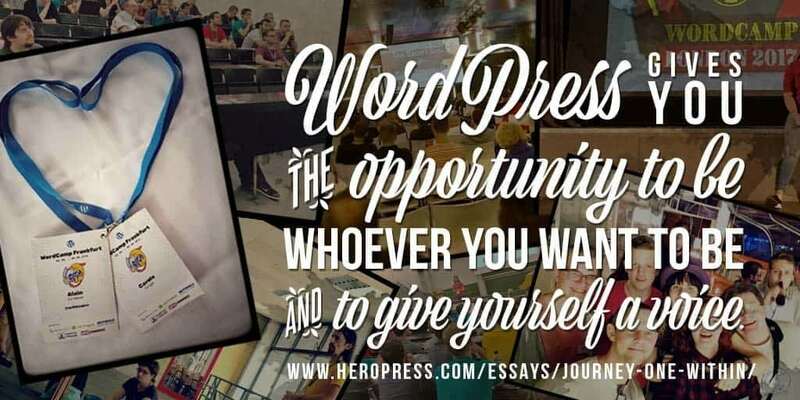 Furthermore I would love to see every WordPress user, blogger, developer, programmer, designer – and even more so their respective partners – joining the nearest WordCamp (or Meetup) and meeting the amazing WordPress community! Especially when you haven’t done this so far. You’ll be able to find inspiration and friends, develop unknown personal skills, gain new perspectives on your job or life and, in any case, learn a lot, just like I did. And last but not least – it can even bring your relationship to a whole new level. I still have no idea where my personal journey will lead me in the end but I have this growing feeling that WordPress could be an integral part of my life. Fortunately, it is already a part of me. The post The Only Journey Is The One Within appeared first on HeroPress.